Know someone who doesn’t love tacos? Well we sure don’t! As these Mexican staple is too far a cry from the unappetizing and fattening fast-food of choice, tacos are now a Tuesday (or everyday) staple and well-loved gourmet treat for foodies all over the world. Make your guacamole first. To a large bowl, add avocados and lime juice. Mash with a fork. Add cilantro and salt. Mix well. Taste and adjust for lime juice and salt. 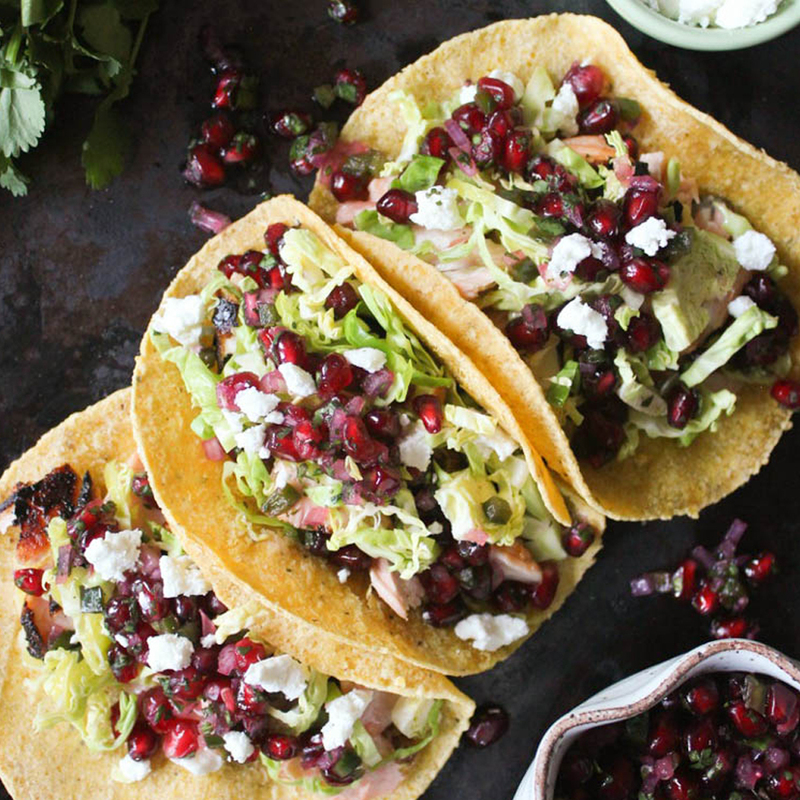 Top with pomegranate seeds and set aside until ready to use. Next, rub down the salmon on each side with ancho powder, paprika and cumin. Heat your pan to medium heat and add a bit of olive oil.Sear each side of the salmon about 3 minutes per side, or until salmon is cooked through. No need to remove the tortillas from the taco holders after removing them in the oven. Rough chop the salmon and divide it between the 6 warmed corn tortillas. Top with the pomegranate guacamole and slices of roasted jalapeno peppers. Serve and enjoy! Sauté the red bell peppers, onions, garlic, mushrooms, and jalapeno peppers in hot oil in a skillet over medium-high heat 5 minutes or until vegetables are tender. Add cumin and oregano; sauté 2 minutes. Stir in wine; reduce heat, and simmer 10 minutes or until liquid is reduced by half. Add beans, and cook until thoroughly heated. Add spinach; cook 2 minutes or until spinach wilts. Serve in warm tortillas using these amazing taco holders then top with cheese, if desired. Saute garlic and ground chicken in olive oil until reduced. Put in some taco seasoning powder. When desired taste is achieved, remove from heat and take out all excess oil. Make your salsa by mixing tomatoes, red onions, jalapenos, lime juice, and cilantro. Set aside in the refrigerator. Assemble your cups and fill each one with your meat, salsa, and toppings. If you think cups are just too small or too many for you to make, use these stainless taco holders to form your cheese tortillas instead.